December issue of Rhythm on sale now! Featuring a Drum Solos extravaganza! This month we pay tribute to the art of the drum solo. 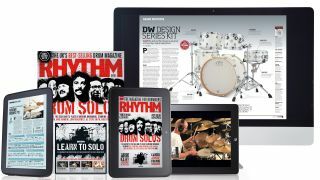 Geoff Nicholls traces the history of the solo and, with the help of some of the most virtuosic players around, including Steve Smith, Mike Portnoy, Mike Mangini, Joey Jordison, Gavin Harrison, John Blackwell Jr, Arejay Hale and Ian Thomas, celebrates the mighty drum solo. Learn how to nail KISS classic Rock and Roll All Nite, Indie Cindy by Pixies and The Jam hit Going Underground. Plus there's all of your favourite regular lessons from Pete Riley, Jason Bowld, Colin Woolway and more.